-Completely rewritten main scripts and remade logic for much better user experience and optimization. -Sounds are now selectable from Configurator and are no more required to download from optional files. -Added option in Configurator to display a notification when fanning is enabled/disabled. -Workbenches in Hidden Bunker are now linked with each other and share one container. This update sets fanning mode and its toggle sound to their default values. (Choose your preferred options in Configurator). Hotfix of buggy 1.6 version. Everything should work now properly. Also you will be able to fan any weapon from other mods which uses corresponding animation keywords. The configurator will be added in your pipboy/aid section when you complete quest. If you already have completed it Configurator will be added automatically when you load your game. - Fixed automatically shooting whole magazine when aiming down sights (now you can normally fan the hammer when aimed). - Added a HUD icon while fanning ability is active. - Custom made vault boy icon for perk. 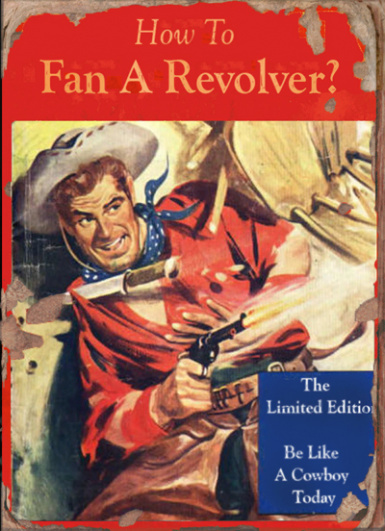 - If you accidentally drop "Toggle Fanning Mode" you can add it by reading the "How to fan a revolver?" magazine. Added two optional files with no sound and softer sound when switching to fanning and back. Choose only one, Install over main file. The mod adds ability to switch between fanning and normal fire mode for any revolver. 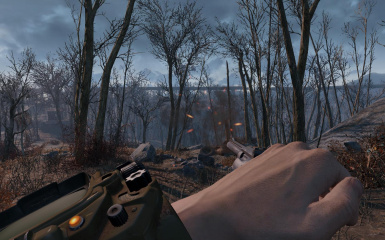 You can fan any revolver from other mods which use .44 revolver animation keyword (anims44), like Remington 1858 e.t.c. V 1.6 adds support for pipe revolvers and any weapon which uses pipe revolver's animation keyword (animsHandmaderevolver). The Speed of fanning depends on quality of your revolver receiver, better receiver = faster fanning. This mod even adds a custom receiver specially for fanning, with increased speed and accuracy. Small quest and unique small bunker which players can use as home. Custom made perk magazine with custom picture. Please don't use console commands to spawn something from this mod before you complete the quest. It starts automatically, is very small and takes only 5 minutes to complete. The only reason I made a quest and a custom magazine for Fanning Ability is that I don't like when new stuff is added in game without some lore explanation if possible. The Fanning animation is from vanilla game and is 1st person only, so there are no 3rd person animations available at this moment. As fanning animations weren't made for pipe revolvers, while shooting them cylinder moves back. That's slightly visible but anyways. I can't fix that without directly editing animations. Check Mechtechnal's Weapon Jams, if you ever wondered why a 200 old years weapon fires fine on every trigger pull.